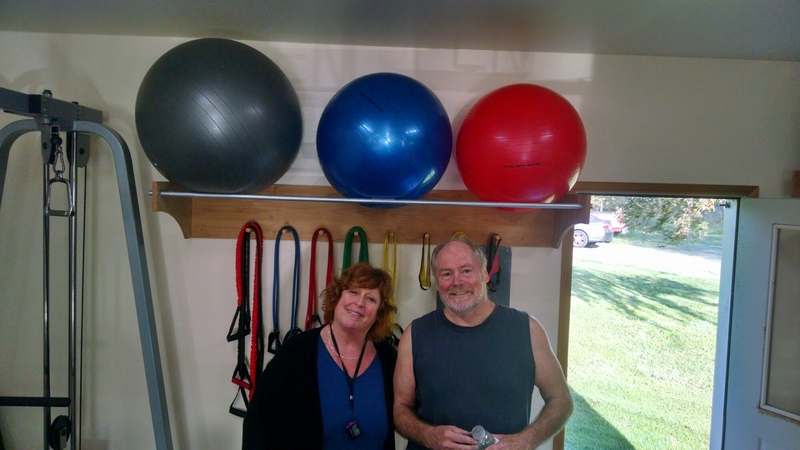 In December 2014, Aaron Dye decided to close down Island Body and Fitness, much to the chagrin of the loyal followers of fitness class instructor, Heidi Strong. It’s not like they could simply switch over to the local Gold’s Gym or 24 Hour Fitness. Not willing to leave these fitness-minded Lopezians in the cold, the community did what it does best: it stepped up to answer a need in a way that market forces sometimes can’t on an island of 2500 people. A small group that included Laura Adams, Mark and Kim Herrenkohl, Pamela McCabe, Beth Shirk, and Lexi and Kirm Taylor decided to find a place where Heidi could continue hosting fitness classes. They rented the building that used to house Paper Scissors on the Rock, and Aaron Dye graciously donated all of the equipment from the gym he’d closed down. Before they knew it, these Lopezians had started another fitness club, quickly filling the gap that had been created. 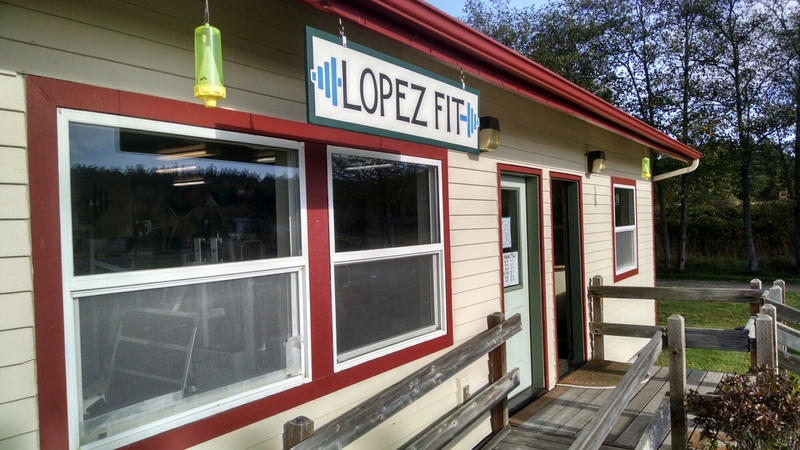 On January 3, 2015, Lopez Fit opened its doors. “We didn’t realize we’d be starting a business,” said Lopez Fit Board Chair, Beth Shirk. She and the rest of the group who started the gym soon decided they “needed to be all in” if they were to adequately maintain a place for the community to work out. “It was daunting at first,” said board member, Lexi Taylor. To run a place where people used heavy equipment that needed to be maintained and supervised, the group would need insurance, help with contracts, some way to pay rent and employee taxes, among numerous other requirements. Yet, Island Body and Fitness closed its doors for a reason – gyms aren’t exactly the easiest businesses to run. On average, 80% of people who join a gym cancel their membership within 5 months. And membership dues never generate enough money to cover gym costs, which typically range between $150,000 and $200,000 in the first year. To overcome many of the financial challenges, the Lopez Fit Board made the gym a Washington State non-profit. It has two part-time employees, Heidi Strong and White Bear. The rest of the labor – two-thirds of it – comes from volunteers. Jerry Manion and Steve Adams help maintain the equipment. Board members take turns staffing the front counter and thoroughly cleaning the facilities. These efforts, combined with the fact that the equipment, flooring and mirrors were all donated by Dye, take a lot of the costs out of the operation and help keep membership fees low. Lopez Fit charges only $43 to join for a month. The average monthly gym membership in the U.S. is $58. In Seattle, the average person spends $91 a month to belong to a gym. Is the $430 annual membership worth it? Just ask Teri Linneman. 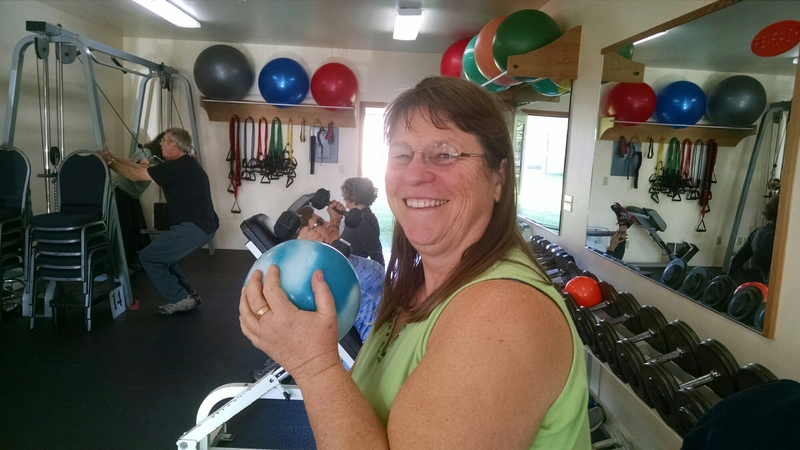 In January 2015, Teri found herself 100 pounds overweight. In her words, she “was feeling pretty unfit.” Although Teri was nervous about joining a gym, she was encouraged by friends to check out Lopez Fit. She signed up for Heidi’s circuit class and loved it. In the ten months since she’s been going to the gym, she’s lost 60 pounds and plans on losing another 40. Weight loss and getting into shape are just a few of the reasons people love Lopez Fit. “[It] is just right for Lopez,” said Teri. “It has just enough equipment to keep anyone in shape and to keep your workout interesting.” And the workouts do sound interesting. On a recent visit to the gym, every person there told me about how Heidi’s circuit classes usually break into karaoke sessions. With no TVs on the walls, workouts and classes are a lot more interactive than what you might find in a typical gym. “We take our wellness seriously, but we don’t take ourselves seriously,” Beth Shirk explained, as she, Laura Adams and Lexi Taylor gave me a tour of the super clean, bright, airy facility. After hearing from the board and several Lopez Fit members, it’s clear that the gym has something to offer everyone. The membership resembles the demographics of the island, though Beth admits it skews female. 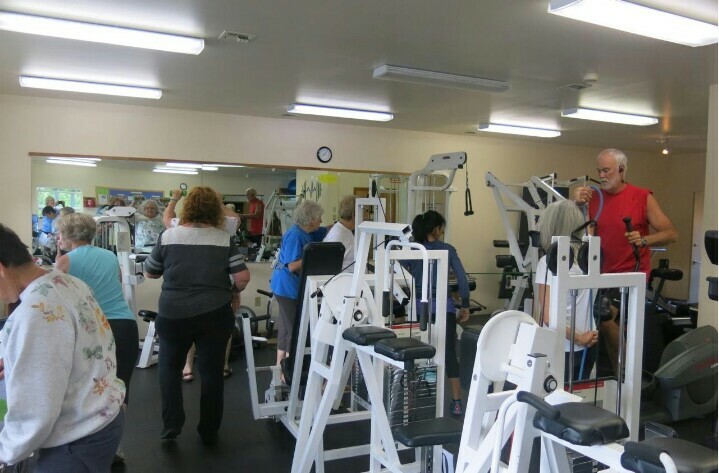 To make sure everybody does feel welcome to join, Lopez Fit, due to a grant from the Family Resource Center, offers scholarships to help people pay membership fees. And, there are a variety of ways to try it out – from 10-visit passes to the $10 drop-in cost, which tourists and seasonal residents appreciate. After 10 months of operation, Lopez Fit is thriving. It’s at 125 active members – roughly 5% of the population of Lopez. Beth Shirk says she’d like to see that grow to 10%, which seems very doable given the buzz that has developed due to success stories from people like Teri Linneman. Hitting the 250 member goal would allow for more investment in the gym, including more staff to ensure it remains a fun and well-maintained outfit. No matter how many members it generates, though, the gym will always need other types of fundraising – like its Phantom Fundraiser – to keep the doors open. Fitness-minded Lopezians will appreciate that this fundraiser is a “non-event,” with no potluck food to have to work off. If you haven’t been to Lopez Fit, check it out. It’s right across the street from the Lopez Village Market. Whether you’re looking to lose weight, limber up or sing karaoke, you’ll find it’s a good fit.